Named a 2015 Record To Die For by Stereophile magazine. http://www.stereophile.com/content/2015-records-die-page-6. Michael Fremer of Analog Planet gives our Scheherazade The Thumbs Up! "Just received your new vinyl of Scheherazade, Pictures and Pines and Fountains of Rome. After listening I have never heard anything that comes close to the glorious sound of these records. I have original vinyl, CD's, SACD's, XRCD's, Chesky and Classic Records remasters and nothing comes close to how good these sound. The overall balance of all the sections of the orchestra is superb. Wood winds are gorgeous. I will be buying more." Customer Reviews (4.86 Stars) 14 person(s) rated this product. I admit I am not a classical connoiseur at all. and I'm sure I spelled connouseur wrong, probably twice now! An audiophile vinyl friend said I HAD to get this. I was reluctant, I mean, it's not Pearl Jam or the Black Keys for g-d sakes. So, I bought it and it came today. I made sure to clean it, as I do with all new vinyl and wow! This is amazing! I am a convert. I put it on, low volume, it was nice. Jammed it up quite a bit and just wow! no clicks, pops or hisses, just clean clean clean. Get this! incredible record. made a believer out of me. i am in for the series! I have bought the first 3 titles of this series & this one is the only one I have listened to so far. It's nothing short of amazing. The 200 Gram vinyl is dead-quiet & with no ticks or pops.I would have to say that this is one of my favorite classical albums of all time. 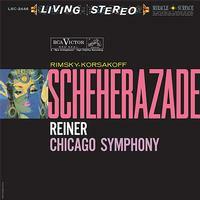 I'm a big fan of anything by Fritz Reiner & The Chicago Symphony. This album sounds much better than the Classic Records issues of this series which I paid a fortune for some of them when Classic decided to discontinue their catalog. Chad Kassem has indeed done well with reissuing this series. Way to go Chad!! I plan to buy them all. This LP is pretty much everything I hoped it would be: great sound, flat, quiet pressing (although I did have to return the first one I got because of a slight dish-warp) and a very tasty package. The jacket has the same high- gloss finish as the Prestige mono series. I don't know if that is period- accurate for this LP, but the the original Living Stereo titles that I have in my collection feature more of a matte finish like the Patsy Cline LP. Minor quibble, though. Can't wait to get Pines and Pictures now. I wish I was experiencing the sonic perfection everyone is talking about. It was with great anticipation that I dropped the needle on Scheherazade, only to be greeted with annoying pops, crackles and ticks every few seconds. A trip to the vacuum record cleaning machine didn't help, nor did repeated hits on my industrial anti-static machine. No, the noise is pressed in. Amazingly, all three of these first albums had the same problem. The Resphigi had fewer pops, but had a near continuous low-level crackle in the right channel through the very long quiet sections. Pictures at an Exhibition was more like the Scheherazade -- pop, crackle, tick, tick, crackle, pop. Other albums that arrived in the same order are fine, and very quiet, so it's not some problem with my system. Maybe it's time to slow down, and focus on the "Quality" in the record pressings. Can I really be that unlucky that the only three noisy discs would come to me? This pressing and performance are the gold standard of sound and artistry and far superior to any other version of Scheherazade. I have a Decca Phase4 recording with Stokowski and a Melodya Russian pressing with Svetlanov and they don't compare. If you are reading anything about these records you already know about the originals and I have them all including 2 1S copies of this one. The funny thing is, after everyone hears about these and wants them it will be too late to get them. Forget about the attempt by Classic in the 90's. All that did was to make the originals sound better. These are special. Anybody want a 1S Pines, It's perfect. How about a 23S Pictures It's perfect to. They are better than the Sheffields, the Blue Backs and the Mercs. Got all those to. THIS IS THE CLOSEST YOU CAN GET TO A MASTER TAPE. I have compared this pressing to a 1S sd, a wd, a red label, two European versions, and the 90's reissue. I also have non released copies of the Classic reissues of Pines and Witches Brew of the Classic version on Clarity vinyl. The Clarity vinyls are QUITE GOOD indeed, but not in the league with these. So Chad, congratulations on a crowning achievement. Can't wait for the next issues. This review applies equally to all three reissues thus far released (Scheherazade, Pictures at an Exhibition and Pines / Fountains of Rome). Once again Quality Record pressings continues to produce superb 200 gram pressings, being as quiet and flawless as I have ever heard. Whilst I have never heard the original vinyl releases, I have heard these recordings in various other incarnations (the original RCA CD reissues from the early 90s, the SACDs from the mid 2000s as well as the many of the vinyl reissues from Classic Records). I bought this recording in its original incarnation after hearing it at the audio show at the NY Coliseum, c. 1961 and have owned every audiophile reissue since. Never before, neither in this recording nor in any other, have I heard the wonderful Chicago Symphony strings reproduced so faithfully, with the depth tone and dead-on intonation one encounters in the concert hall; an equal partner to the fabled brass section. Merci beaucoup! I have both a shaded dog (S1/S1) and Chesky re-issue. This new one by AS is hands down superior in every way. A steal at $30. Can't wait for more titles planned on this project to be pressed.